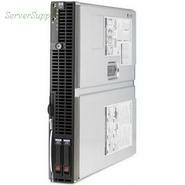 Hewlett Packard - 438084-001 438084-001 HP Proliant Dl580 G5 High Performance 4p Intel Xeon E7340 Qc 2.4GHz 8GB Ram SAS SATA Hot Swap Dvd rom 2 X Gigabit Ethernet Ilo 4 X Ps 4u Rack Server. New Bulk Pack. Hewlett Packard - 443528-B21 443528-B21 HP Proliant BL680C G5 2 X Xeon E7340 Qc 2.4GHZ 8GB Ram SAS SATA Hot Swap Gigabit Etgernet ILO Blade System. New Bulk Pack. Hewlett Packard - 443528-B21 HP/COMPAQ - PROLIANT BL680C G5 - 2 X XEON E7340 QC 2.4GHZ 8GB RAM SAS/SATA HS GIGABIT ETGERNET ILO BLADE SYSTEM (443528-B21). NEW. IN STOCK.